Learn how to deepen romantic and soulmate love from Sacred Feminine coach, healer and author Syma Kharal. Syma shares Goddess coaching for women on how to create a happy and fulfilling romantic relationship and marriage. 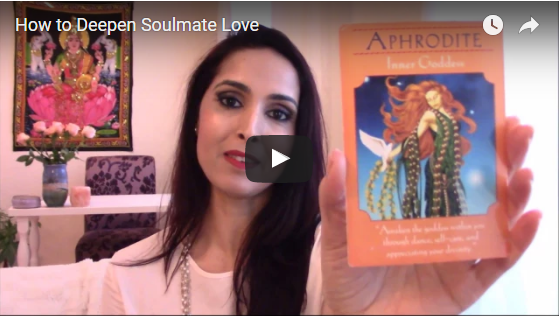 Whether you are single, coupled or married, these spiritual tips will support you in making love last and grow and flourish as soulmates. She teaches the importance of self-love and divine love in order to have deep, true love with your beloved. Join our Monthly Goddess Circles for more in-depth support and sacred sisterhood. It’s all about Love in February, where I will share Goddess coaching, a live guided meditation to help you heal blocks to self, romantic and Divine love and an oracle reading in our Circle, “Awakening Aphrodite: Becoming a Goddess of Love.” Get details and join below.